Sportaid, Elbow Brace, Neoprene Support, Blue, X-Large Tennis elbow sleeve. 10 long, slip-on style with tapered fit. Features loop-lock tension strap which applies pressure to muscles of the forearm. Blue nylon exterior, black interior, 1/8 neoprene. 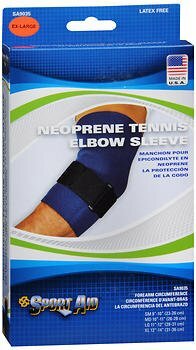 Sportaid, Elbow Brace, Neoprene Support, Blue, X-Large Tennis elbow sleeve. 10 long, slip-on style with tapered fit. Features loop-lock tension strap which applies pressure to muscles of the forearm. Blue nylon exterior, black interior, 1/8 neoprene.